Nowadays, entirely apart from the question of whether you’re engaging in illegal activity, it can be important to protect your privacy while participating in public protests. Local and federal law enforcement agencies are compiling extensive files on everyone they deem suspect; if you don’t want them invading your privacy, it may be appropriate for you to remain anonymous while exercising your supposed right to free speech. The same goes double if you lack the privileges of citizenship or you fear your employer may discriminate against you for your political beliefs. In the light of the felony charges resulting from the recent RNC protests, it is especially important for activists to be aware of this. We’ve already published extensively on this topic, most notably in the guide Blocs, Black and Otherwise. The following is largely a refresher for anyone who needs it before hitting the streets again. Do you desire to be an autonomous individual rather than a faceless, mass-produced cog in the machine? Great! That is, unless you are marching in a bloc—where conformity is a weapon that you can use to smash the machine itself. The goal of the bloc as a tactic is to have everyone look as similar as possible, so that, ideally, no single individual can be identified within the anonymous mass. This helps to keep everybody safer. If only some people within a bloc take these precautions, the cops can more easily spot and target individuals and groups, which is dangerous both for those who are acting within the bloc and for those who are not. Those who make the effort to stay anonymous can draw extra police attention; those who don’t can be more easily identified, which can make them easier targets. Neither of these situations is desirable. Take this stuff seriously! If you’re setting out to accomplish something risky, taking these precautions is crucial. 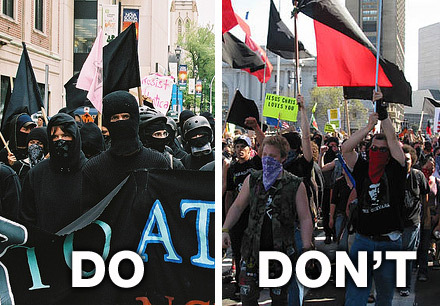 If you’re not, you can help to protect your comrades and avoid making yourself a target. If you’re going to wear a mask, keep it on at all appropriate times! If you are captured on camera or witnessed at any point with your mask off, you can then be easily identified with it on. Be extremely conscientious about where and when you change into and out of your mask and anonymous clothing; there should be no cameras or hostile witnesses. If possible, explore the area in advance to find appropriate spaces for changing. Remember that police are especially likely to target masked individuals who are not in a crowd that is similarly dressed. Wear different outfits layered one upon the other, so you’ll be prepared for any eventuality. Ideally, you should have one outfit for getting to the site of the action without attracting attention, your anonymous gear for the action itself, and then another outfit underneath so you can look like a harmless civilian as you exit the area. Don’t forget to stay hydrated, particularly if all those clothes get hot. If you have tattoos that are or could be visible, cover them up! You can do this with makeup or concealer, especially if you use heavy-duty products designed for that purpose. Many actors and dancers use Dermablend to cover up tattoos, burns, and scars. It comes in numerous colors that can be mixed to match your skin tone, and it’s water resistant and rated for 12 hours of wear. It’s expensive, but cheaper than bail! If you can’t find Dermablend or a similar product, cover your tattoos with clothing that won’t ride up. Tuck your clothing in if you have to. Do not march in a bloc wearing your regular clothing, especially if it’s distinctive. Cops may be stupid, but they can probably match the pictures of the masked-up person with the purple polka-dotted pants to pictures of the same person in the same outfit minus the mask—even if the pictures were taken on different days. If you are going to carry a backpack or bag, don’t take the one you carry around in everyday life. No matter how perfect your outfit is, it’s all for naught if your bag is recognizable—especially if, like many people, you change bags much less frequently than you change clothes. Do not wear patches or other identifiable insignia on your clothing while in a bloc, unless everyone else has exactly the same ones in exactly the same places. Don’t just cover your face! Bandanas are popular and convenient, but they don’t conceal enough. Cover your head completely so your hair cannot be seen—especially if it’s distinctive. In a black bloc, you can do this by wearing a ski mask or making a mask out of a T-shirt—stretch the neck hole across your eyes and tie the sleeves behind your head, with the rest of the shirt covering your head and shoulders. In other circumstances, you could try a wig, if that fits the aesthetic of your action. If possible, cover your eyes. Goggles can do this while serving the dual purpose of protecting your eyes from chemical weapons; nondescript sunglasses could also work in a pinch. Both of these can be obtained in prescription form and are better to use than your regular glasses, particularly if your regular glasses are distinctive. Contact lenses are not recommended in situations where you may come into contact with chemical weapons. Be careful not to leave fingerprints and DNA evidence! Wear cloth gloves—leather and latex can retain fingerprints and even pass them on to objects you touch. Wipe down tools and other items with alcohol in advance, to clean fingerprints off them—you never know what might get lost in the chaos. Don’t forget about the batteries inside flashlights! Practice at home! Don’t go out in a bulky outfit you’ve never worn before expecting to pull off cop-shocking feats of dexterity. You need to be familiar with your outfit and comfortable moving in it; it’s important that your vision isn’t compromised, too. Do not let any of this give you a false sense of security. Be careful! Assess your relationship to risk honestly; don’t do anything if you’re not sure you could live with the worst possible consequences. Stay aware of your surroundings and listen to your instincts. Make sure you know and trust the people you’re working with, especially when it comes to high-risk activities. Practice proper security culture at all times. Know and assert your legal rights [PDF - .9 MB], especially in stressful situations. Doing so may not make things better, but failing to do so will certainly make them worse! Don’t get caught! Stay safe(r), and smash the state! Sign up here to receive regular email updates.